So far Tony Cube has created 4 blog entries. 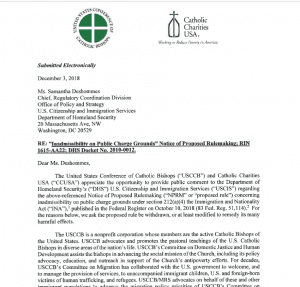 The USCCB’s Domestic Social Development and Migration and Refugee Services, and Catholic Charities USA presented information about potential consequences for immigrants accessing available public benefits. Below are the slides and webinar recording. 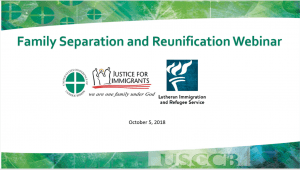 On October 5, 2018, USCCB/Migration and Refugee Services and the Lutheran Immigration and Refugee Service presented information about family separation and reunification. Below are the webinar slides. WASHINGTON — On January 8th, the Department of Homeland Security (DHS) announced that it is terminating Temporary Protected Status (TPS) for El Salvador. TPS is a temporary, renewable, and statutorily authorized humanitarian migration program that permits individuals to remain and work lawfully in the U.S. during a period in which it is deemed unsafe for nationals of that country to return home. The vast majority of TPS recipients in the U.S. are Salvadoran. “The decision to terminate TPS for El Salvador is heartbreaking. As detailed in our recent delegation trip report to the region, El Salvador is currently not in a position to adequately handle the return of the roughly 200,000 Salvadoran TPS recipients. Today’s decision will fragment American families, leaving over 192,000 U.S. citizen children of Salvadoran TPS recipients with uncertain futures. Families will be needlessly separated because of this decision. We believe that God has called us to care for the foreigner and the marginalized: ‘So you too should love the resident alien, for that is what you were in the land of Egypt’ (Deut. 10:19). Our nation must not turn its back on TPS recipients and their families; they too are children of God. DHS has provided an 18-month period (through September 9, 2019) during which TPS recipients from El Salvador can legally stay in the United States and prepare for their departure. While we recognize and appreciate this extra time, it will not remedy the underlying protection and family unity concerns that remain for Salvadoran TPS recipients. We renew our call to Congress to work in a bipartisan manner to find a legislative solution for long-term TPS recipients, and we stand ready to support such efforts. TPS recipients are an integral part of our communities, churches, and nation. Without action by Congress, however, recipients’ lives will be upended and many families will be devastated. As with DACA, we strongly urge Congressional members and leadership to come together and address this issue as soon as possible.